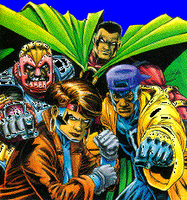 Code, Joe and Max are black religious superheroes in The Guardian Line of of comic boiks published by Milestone Media. Milestone Media joined forces with Chicago-based Urban Ministries Inc to increase market penetration. Urban Ministries Inc, founded in 1970, is an independently owned and operated African American Christian media company with a distribution network of 40,000 churches and 1,500 bookstores for its books, CDs and DVDs.